The Chicago Cubs head to Busch Stadium on Wednesday, September 27, 2017 to take on the St. Louis Cardinals. The expected starting pitchers are John Lackey for the Cubs and Michael Wacha for the Cardinals. The odds for this matchup have Chicago at -185 and St. Louis at +174. The Cubs have a 73-76-7 over/under mark and a 69-87-0 run line record. The Cardinals are 75-81-0 against the run line and have a 79-69-8 over/under record. The Cubs have a 88-68 overall record this season. Starting pitcher John Lackey has a 11-11 record with an earned run average of 4.67 and a WHIP of 1.30. He has 145 strikeouts over his 163.2 innings pitched and he's given up 161 hits. He allows 8.9 hits per 9 innings and he has a FIP of 5.39. The bullpen has an earned run average of 3.88 and they have given up 436 base hits on the year. Teams are hitting .221 against the bullpen and they've struck out 589 hitters and walked 250 batters. As a team, Chicago allows 8.1 hits per nine innings while striking out 8.9 batters per nine innings. They are 10th in the league in team earned run average at 4.01. The Cubs pitchers collectively have given up 1,247 base hits and 621 earned runs. They have allowed 190 home runs this season, ranking them 15th in the league. Chicago as a pitching staff has walked 536 batters and struck out 1,378. They have walked 3.5 men per 9 innings while striking out 8.9 per 9. They have a team WHIP of 1.28 and their FIP as a unit is 4.24. As a team Chicago is hitting .256, good for 16th in the league. The Cubs hold a .439 team slugging percentage and an on-base percentage of .339, which is good for 3rd in baseball. They rank 16th in MLB with 8.7 hits per game. 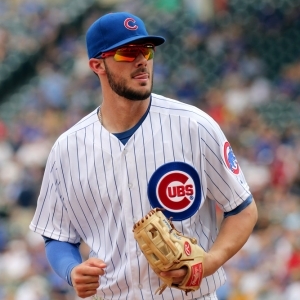 Kris Bryant is hitting .297 with an on-base percentage of .411. He has 160 hits this season in 538 at bats with 73 runs batted in. He has a slugging percentage of .543 and an OPS+ of 145. Anthony Rizzo is hitting .276 this year and he has an on-base percentage of .395. He has totaled 155 hits and he has driven in 109 men in 562 at bats. His OPS+ is 134 while his slugging percentage is at .514. The Cubs have 1,358 hits, including 267 doubles and 215 home runs. Chicago has walked 599 times so far this season and they have struck out 1,347 times as a unit. They have left 1,107 men on base and have a team OPS of .778. They score 5.08 runs per contest and have scored a total of 793 runs this year. St. Louis has a 81-75 overall mark this year. With an earned run average of 4.00, Michael Wacha has a 12-8 record and a 1.36 WHIP. He has 150 strikeouts over the 159.2 innings he's pitched. He's also given up 163 hits. He allows 9.2 hits per nine innings and his FIP stands at 3.63. The bullpen has an earned run average of 3.87 and they have given up 477 base hits on the year. Teams are hitting .245 against the Cardinals bullpen. Their relievers have struck out 501 batters and walked 174 opposing hitters. As a team, St. Louis allows 8.7 hits per nine innings while striking out 8.3 batters per nine innings. They are 7th in the league in team earned run average at 3.98. The Cardinals pitchers as a team have surrendered 1,342 base knocks and 616 earned runs this season. They have given up 175 home runs this year, which ranks 28th in Major League Baseball. St. Louis as a staff has walked 468 hitters and struck out 1,291 batters. They give up a walk 3 times per 9 innings while they strike out 8.3 per 9. Their team WHIP is 1.30 while their FIP as a staff is 4.08. As a team, they are batting .258, good for 15th in the league. The Cardinals hold a .428 team slugging percentage and an on-base percentage of .336, which is good for 5th in baseball. They rank 15th in MLB with 8.7 hits per contest. Matt Carpenter comes into this matchup batting .244 with an OBP of .386. He has 119 hits this year along with 68 RBI in 487 AB's. He maintains a slugging percentage of .452 with an OPS+ of 121. Yadier Molina is hitting .273 this season and he has an OBP of .312. He has collected 137 hits in 501 at bats while driving in 82 runs. He has an OPS+ of 96 and a slugging percentage of .439. The Cardinals as a team have 1,364 base knocks, including 279 doubles and 189 home runs. St. Louis has walked 572 times this season and they have struck out 1,293 times. They have had 1,087 runners left on base and have an OPS of .764. They have scored 4.74 runs per contest and totaled 740 runs this season. Who will win tonight's Cubs/Cardinals MLB game against the spread?